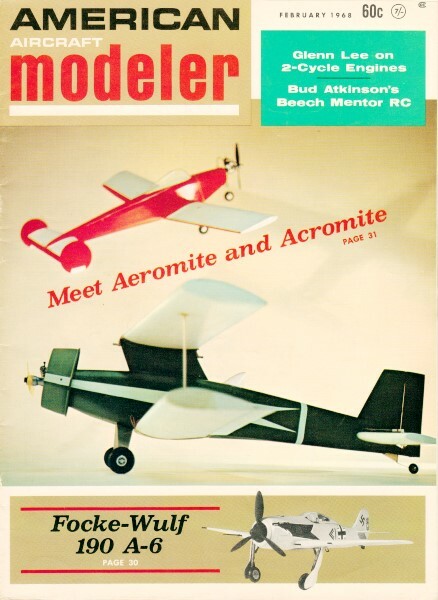 Even while electric propulsion systems are gaining ground in the modeling realm, 2- and 4-cylinder engines are still quite popular amongst modelers. I have made a switchover totally to electric, but I sure miss the sound and smell of the nitro engines. For those who still use internal combustion engines, and for those who just want to learn a little more about how these model engines work, this article by Glenn Lee will be a very useful read. There's more to a miniature powerplant than meets the eye. The MVVS 2.5 c.c, glow engine features a rear exhaust, Schnuerle porting, ball bearings and a crankshaft rotary valve intake. A rear view of the MVVS 2.5 c.c. glow engine. 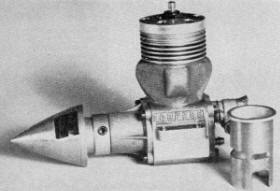 Prototypes of this engine have placed high in international speed contests. 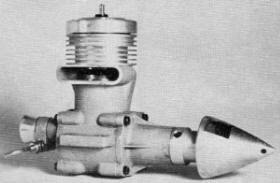 Figure 3: A "double -piston" engine. 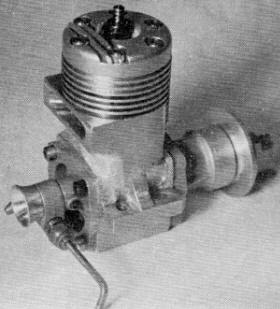 The experimental K&B 15RC glow engine built by Bill Wisniewski and flown to first place in the 1964 World Championships. Bill is famed for his "tuned pipe" used on speed engines. Left-side of K&B 15RS with cylinder sleeve shows "lumps" on case where three ports are located. Piston skirt notched to match lower part of sleeve. Figure 5: A 'side-port" engine. The air intake usually enters at the rear of the case. An O. S. 2.5 cc glow engine is an excellent low-priced powerplant. Features cross scavenging with front rotary valve and bronze sleeve bearing. A 1966 series K&B .29 high-performance engine has cross scavenging, ball-bearing crankshaft, and a rear-disk rotary valve intake. Cross scavenging is used in many engines today. Rear-exhaust 2.5 cc engine built by the author using MOKI crank­shaft, Super Tigre piston and head, and homemade crankcase and sleeve with Schnuerle porting. Bypass covers are epoxied and bolted on this .40 cu. in. engine built by the author. K&B .29 crankshaft and rotary valve used; crankcase machined from bar stock. MANY test articles have been written about engines, but few have explained many of the terms used. Almost all model engines used today are two-cycle; that is the engine fires every revolution. (See Fig. 1.) They are much simpler than four-cycle engines since they have no oil pumps, timing gears, camshafts, or head valves. They have their own problems, however, and this article will try to explain some of the design differences in engines available today and yesterday. Two-cycle engines: First, consider the methods of getting a fresh charge of fuel and air into the cylinder and the exhaust gases out. 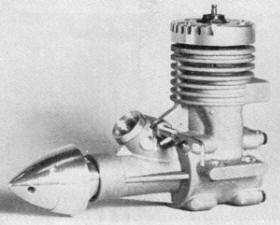 The four strokes use an entire revolution of the crankshaft to pump the exhaust gases out and draw in a fresh charge. This pumping process results in a large frictional loss within the engine. In the two strokes, the charge is allowed in and the exhaust out during the lower part of each revolution. This results in a loss of power stroke and also mixes the fresh charge with part of the just-fired charge. The two-stroke engine also labors from "crankcase scavenging." The crankcase is sealed, and the up and down travel of the piston acts like a pump to give positive and negative pressure in the crankcase. Valves are used to allow a fresh fuel-air charge to enter the case when the piston is going up. 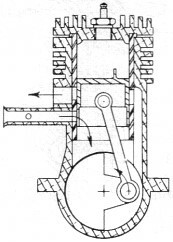 The valve is then closed and the downward travel of the piston compresses the charge. When the piston opens the bypass port, this compressed charge is directed up into the cylinder. As shown in Fig. 1., the exhaust port usually opens just before the bypass port and allows the burned gases to get out with a minimum of mixing with the fresh charge. This is "cylinder scaveng­ing." Several different methods of scavenging will be discussed later. Figure 1: The two-cycle sequence. a. Air intake is closed, piston is compressing the crank­case charge. b. Bottom of stroke. ports open. cylinder scavenging tokes place. 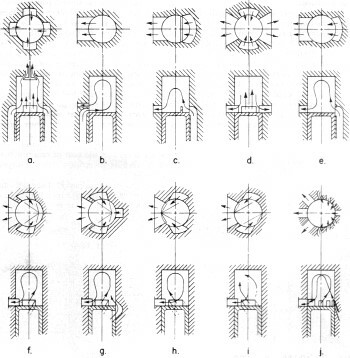 c. Piston is drawing in a fresh charge as it compresses the cylinder charge. Combustion tokes place. air intake is almost closed again. Since the crankcase acts as the fuel pump, lubricating oil must be mixed with the fuel. The fuel is vaporized, and a layer of oil is left on all surfaces. Most of the oil goes through the crankcase and is burned in the cylinder or blown out the exhaust. This system is simpler than any pressure oil system, and you get an oil change every revolution. The cylinder walls are lubricated very well this way, resulting in low friction and long life. The oil mist lubrication, however, does reduce the amount of fuel-air mixture we can get into the cylinder. Bearings do not always get an adequate supply of oil, and sleeve type bearings must be very loose. Scavenging: Going back to cylinder scavenging, there are several different designs regularly used as diagramed in Fig. 2. All of them use an air blast coming through ports in the cylinder walls to force the exhaust gases out. Some names given to these methods of scavenging are: Uniflow, double-piston, cross, and loop. There are several variations of loop scavenging: Schnuerle, Curtis, reverse loop, and laminar flow. The uniflow engine has the cylinder, and gases flow only one way. The fresh charge coming in just above the piston pushes the exhaust gases out the top. Some method must be used to open the valve at the proper time, such as a cam and rocker arm. 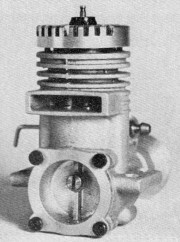 Many years ago, Dooling experimented with an engine using a rotary valve in the head driven by a gear train, but was troubled by seizing problems due to high temperature exhaust gases. Figure 2: Types of scavenging. Cross scavenging is the type used in many engines sold today, such as McCoy, K&B, Fox, and O.S. Cross-flow engines have the bypass ports located on one side of the cylinder and the exhaust ports on the opposite side. The piston has a deflector baffle on the top to deflect the in­coming charge up into the top of the cylinder. The cross-flow engines have several minor disadvantages. The piston baffle is directly in the combustion chamber, and disturbs uniform combustion. It also overheats and distorts the piston. In fact, the baffle on speed engines usually gets melted away by ultra-high nitro content fuels. There is also a tendency toward a loss of the fresh charge out the exhaust port, with a resulting loss of power and economy. A modification of the cross-flow design is the laminar-flow engine, notably the Super Tigre with its patented bypass port system. In this design, the top edges of the bypass ports are beveled with a double angle such that the air does not break away from the cylinder wall. The fresh charge flows around the bevel and is directed up into the cylinder. The piston top can now be flat, resulting in a uniform combustion chamber, and heat distortions on the piston are minimized. The loop scavenged engines have the bypass ports located to direct the fresh charge against the wall opposite the ex­haust port. The charge then loops up into the cylinder, forcing the exhaust gases down the opposite side and out. The original Schnuerle system used four ports. The bypass ports were on op­posite sides of the cylinder and the exhaust ports were between them. The charge came through the bypass ports, met in the center, and then traveled to the top of the cylinder. The exhaust gases were forced down the sides. Several brands of engines have been built using this system - well-known engines, too. Better results were obtained using a single exhaust port with the bypass ports located on each side of the exhaust and directed toward the opposite cylinder wall. The latest MVVS engine uses this system. Bill Wisniewski's engines with which he won the last two World Cham­pionships used Schnuerle porting with a small additional port opposite the exhaust port. This is called a boost port, uses a laminar flow bevel at the top edge, and directs a charge from under the piston up the cylinder wall. The newest Cox Mark II also uses a similar system. One additional benefit from the Schnuerle porting is improved idling characteristics for RC or other throttle operation. In a cross scavenged engine, the wet fuel charge is directed at the glow plug. At rich settings and low rpm this wet charge puts out the glow plug and the engine stops. With loop scavenging the charge loops past the filament, and the engines can run at very rich, slow settings with­out stopping. The Curtis scavenging uses multiple ports. The ones opposite the exhaust have laminar flow top edges while the others direct the flow away from the ex­haust similar to the Schnuerle system. The reverse-loop scavenging has two bypass ports that direct the fresh charge just above the exhaust port. The charge loops up that cylinder wall, down the side opposite the exhaust, and across the top of the piston. A slight variation to this is the swirl scavenging where one port is directed above the exhaust port and one is directed against the wall opposite the exhaust port. This results in a rotating charge giving high turbulence in the cylinder. 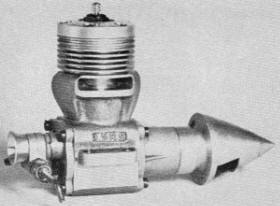 The double-piston engine shown in Fig. 3 has two cylinders with a common combustion chamber and two crankshafts geared together. The inlet ports are located in one end of the cylinder and exhaust ports in the other. By properly phasing the pistons, the exhaust ports can open before the inlet ports, and also close before the inlet ports. The exhaust gases can be cleared with a minimum loss of fresh charge. Complications are the gears and the double height of the engine. Vibration is minimized, however. Porting: The biggest problem of scaveng­ing two-cycle engines is to separate the exhaust residue and the incoming fresh charge. In most engines, the exhaust port opens slightly ahead of the bypass port. The rapid rush of the exhaust gases from the cylinder can cause the pressure in the cylinder to drop below atmospheric, and the resulting vacuum can draw part of the exhaust back into the cylinder. If the exhaust port opens too soon, part of the incoming fresh charge can be lost out the exhaust. The pressure in the cyl­inder is very high during combustion, and very little time is required to let these gases out when the exhaust port opens. 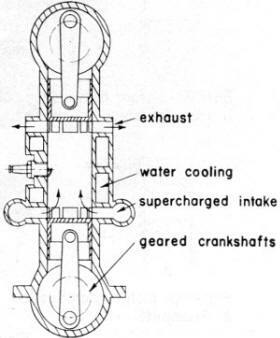 The crankcase pressure, how­ever, is very low, on the order of six pounds per square inch. This low pres­sure cannot force the fresh charge into the cylinder very fast, so the bypass ports must be raised or widened to improve performance. The exhaust port must open before the bypass port, so it must be raised along with the bypass port. The portion of the wall given to porting must be subtracted from the working stroke. So, the height of the ports must be matched to the rpm range at which the engine will be run and also to the burning rate of the fuel used. Racing engines using high nitro content fuels have very high, wide ports, while stunt or sport engines have much lower ports. Port opening periods are usually noted as so many degrees of crankshaft rotation. This is "exhaust timing" and "by­passing timing." For speed engines the best exhaust timing has been found to be near 140 degrees, which means that the piston starts to uncover the exhaust opening when the crankshaft is 70 degrees from bottom dead center and closes when the crankshaft is 70 degrees past bottom dead center. Bypass timing varies from 120 to 130 degrees. The Super Tigre engines have symmetrical timing, the exhaust and bypass open simultaneously. The high pressure of the exhaust gases holds the fresh charge in the crankcase until the majority of the exhaust has gone out the exhaust port and pressure in the cylinder has been reduced below that of the crankcase. This gives the same effect as opening the exhaust port before the bypass yet allows a higher, larger bypass port to be used. To improve scavenging in the cylinder, the main factors are time and the amount of fresh charge that you can get in. At 24,000 rpm, the bypass port is open for less than 1/1000 of a second. This is not enough time to allow a fresh charge to travel from the lower part of the crankcase all the way up into the cylinder. The top of the bypass chamber in the crankcase must be large enough to store a charge until the piston opens the port, letting the charge into the cylinder quite quickly. Crankcase passages must be as large as possible to allow unrestricted flow of gases. On the other hand, this reduces crankcase pumping efficiency and can be detrimental to high speed performance. It has been found that the best solution to this problem is to "pack" the crankcase as much as possible, yet leave a large chamber right next to the bypass ports. Some engines, notably the Dooling, have transfer passages cut through the wall of the piston to allow the charge to travel into short, curved bypass passages. This also allows fresh charges to cool the inside of the piston a little better. One of the greatest improvements in engine design in the last years has been the metallurgy of the sleeve-piston combination. The leaded steel sleeve and hardened cast iron piston is hard to beat, although chrome plating is still being experimentally used. A chrome plated sleeve is almost a necessity for top performance from a ringed, aluminum piston engine since friction is very high between aluminum and steel. Pistons: Pistons, whether iron or aluminum, must be as stiff as possible to minimize warping and heat distortion. The best pistons have annular rings inside just above or below the wrist pin holes which aid in keeping them round. This greatly increases the cost of manufacture, but is usually necessary for high performance. 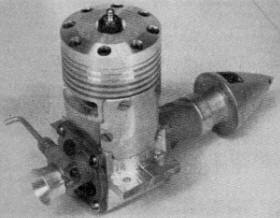 Even with a properly designed and manufactured engine, proper break-in of the sleeve and piston is required. Many attempts have been made to minimize or eliminate break-in running, but few methods are successful. For best per­formance, both the cylinder and the pis­ton should be as round as possible and have the proper clearance to start with. Lapping the piston in its sleeve with some kind of abrasive compound usually results in a ruined engine since softer parts of the sleeve get cut deeper than harder areas. Also, the harder piston will force the abrasive into the soft metal of the sleeve; it does not get washed out, and will most likely cut too much clearance during the first runs. Heating of the piston is not uniform during running, since intensely hot combustion gases heat the top causing it to expand more than the rest of the piston. The metal near the top of a lapped piston must be worn away to allow for this expansion before peak performance can be reached and maximum nitro fuel can be used. This metal worn away amounts to several thousandths of an inch off the diameter. Some of it can be ground away before running, but it is easy to grind too much unless you really know what you are doing. The piston also develops a bulge on the hotter exhaust side which must be worn away. Larger engines have used asymmetrical "earn-turned" pistons where this metal was ground away before assembly. It again is very difficult to grind the proper amount from a piston of the size we use. The two stroke engines run very hot, and air cooling is usually uneven and in­adequate. The main cooling is from the fresh air and fuel coming into the crank­case. Most high performance engines use a "hanger" type cylinder sleeve supported only by the lip at the top. The aluminum crankcase expands more than the sleeve, and even though it may expand unevenly, it does not squeeze the sleeve out of shape. Warped cases or warped sleeves are usually the greatest detriments to engine performance. The importance of proper break-in cannot be overemphasized. Engines on the bench should be run at or slightly above the rpm that they will operate at in the air. A smaller diameter, lower pitch prop allows the engine to be run at operating rpm with a rich needle valve setting. The excess fuel mixture keeps the engine cool and lubricated to prevent tight parts from seizing. One other aspect of proper break-in has to do with the instability of some piston materials. Hardened cast iron is unstable and will actually grow in dimension when it is heat cycled. This growth can be as much as .001" per inch of diameter. As an engine is run, the piston is heated and cooled during every stroke, resulting in a slow growth. This growth, however slight, must be worn away, and the engine is not broken in until the piston has stabilized. The time required for this varies according to the heat treat­ment and the alloy and can be several hours of high rpm running. Head Design: Various head shapes are shown in Fig. 4. The classic domed piston and hemispherical or matched combustion chamber has almost totally been replaced by fiat top pistons and "squish band" heads. The squish band is a circular band that fits very close to the piston at top dead center, and "squishes" the trapped charge into a central combustion chamber. The diameter of the chamber is usually about 65% of the bore diameter, and the depth is varied to give the correct compression ratio. 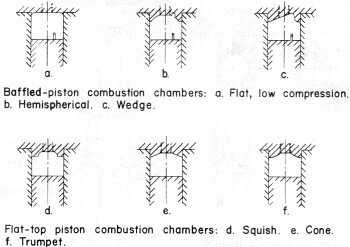 A variation of the squish band head is the "trench" head, where the combustion chamber is a trench milled straight across, leaving wide squish flats on each side. If the squish band is too close to the piston, a hydraulic lock can occur. That is, part of the fuel charge cannot get squished out of the way in time and is trapped. Ex­treme compression ratios result in the squish areas, and the result is erratic running and broken conrods. One way to relieve this problem is to give the squish band a slight angle relative to the piston; three degrees seems to work. Squish band heads do have an effect on the allowable nitro content of racing fuels. Nitro contents as high as 70 and 80 % have been used without detonation. Many other head shapes have been tried, such as the trumpet head in the "Rattler" engines, but compression ratio seems to make a bigger difference than head shape. Compression ratios as high as 18 to one have been used, but few glow plugs will stand up to such punishment. The compression ratio must be matched not only to your fuel, but to the weather as well. Test run­ning and test flying is the only way to find the proper combinations. Air Intake: So far, we have talked about cylinder-piston combinations and head shapes, but we must also have an efficient means of getting fuel and air into the engine. The simplest method of air induction is the "side port" system as shown in Fig. 5 where the intake port is uncovered by the piston skirt when the piston nears the top of its stroke. 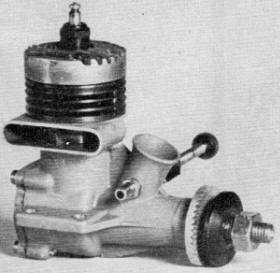 A pipe leads from the needle valve to the port, and when the port is opened by the piston skirt, the vacuum in the crankcase draws in the fresh charge. Many model engines have been built this way, but better results are obtained by rotary valves. Some engines have been built using reed valves. These are simply a one-way valve formed by flat, thin, spring steel or beryllium copper reeds. When the piston goes up, negative pressure opens the reed allowing the fresh charge to come in, and when the piston starts down the reed closes. Disadvantages to this system are that the intake timing cannot be controlled, and the engine can also run in either direction. The best, yet most complicated and most expensive system is the rotary valve. There are several types, but all of them use a rotary shaft or disk to open and close the air intake hole at the proper time. The simplest rotary valve is the hole through the crankshaft that valves the fuel and air into the crankcase through a port in the main bearing. One advantage to this system is the oil mist cooling of the crankshaft and bearings. The disadvantage is that the crankcase compression cannot be very high with the large hole in the crankshaft. Oversize bearings must also be used. The rear rotary valve is a disk or drum that is rotated by the crankpin. A large segment of the disk is cut away to allow passage of fuel and air, and opens and closes the intake port as it is rotated. Different manufacturers use different intake timing, but usually the valve opens after the crankshaft has rotated 35 to 45 degrees past bottom dead center and closes near 45 degrees after top dead center. Much has been written on hop-up procedures where techniques are stressed on polishing all air passages, but this can sometimes give a reduction of performance. Oil from the fuel will stick to a highly polished surface while it can be swept away from a rougher surface. If it sticks and piles up in the bypass, the result will be a smaller passage for air flow. Any gain from polishing is usually from the removal of metal, giving a larger passage. I hope this article has explained a few of the principles of two-cycle engines without antagonizing anyone. I have purposely neglected such things as superchargers or tuned systems. Most engine designs are many years old, but there should be room for more development of the basic systems. Titanium pistons, for example, do not work, but bushed titanium conrods are already being used. Such metals as beryllium and single crystal iron must be tried for pistons or sleeves. Much experimental work is left.